Almost every car owner knows how important oil is for the car. Adequate lubrication keeps the car’s mechanical components in a good shape and helps these parts keep running for a long period of time. Every car owner also understands the importance of putting the right amount of oil in the vehicle as putting too much or too little oil can cause problems within the mechanical components. Besides oil specification and amount, it is also necessary to consider what brand you are opting for and the quality of the oil. There are a lot of options available in the market but the cheapest product is Supertech. There is a lot of speculation in the automotive world regarding who makes Supertech Oil and how is it available so cheap compared to its competitors, so in this article, we will look at some vital information regarding Supertech Oil. You will find a number of online forums discussing where is Supertech Oil made and what the company produces them. The oil is produced by Warren Oil Company, Inc. which is one of America’s largest independent lubricant manufacturer. You can easily spot WPP written at the bottom of the Supertech Oil container. The best place to buy the Supertech Motor Oil is Wal-Mart, eBay, Amazon or another large online store. If you want to check it out on Amazon, you can do it here. Remember that it’s important to choose the right engine oil for your engine. How is the Quality of Supertech Oil? Supertech Oil is probably one of the cheapest motor oil available in the market because of which people have this concern that it may not be of top quality. However, that is not the case and in fact, Supertech Motor Oil complies to all the standards and requirements set by the government ensuring that it is of the highest quality. Moreover, since Supertech Motor Oil is a licensed dexos 1 brand, your vehicle warranty will not void if you use the brand. Check the specifications for your car model to make sure that the engine oil got the requirements that you need. If you have an older car that you want cheap and reliable engine oil for, the Supertech is a great choice. One of the most popular motor oil available in the market is Mobil 1 which is highly regarded by a lot of auto specialists due to its quality and durability. Moreover, Mobil 1 is the official motor oil for Nascar and has been promoted and authorized by a number of automotive specialists and racing experts. 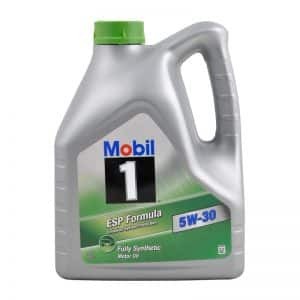 Due to its popularity and association with NASCAR, Mobil 1 is a lot more expensive compared to Supertech Oil but are they any different in terms of quality as well? We cannot truly say for sure whether both the oils are identical but it is a fact that they do share a number of similar characteristics. For instance, both Supertech and Mobil 1 are synthetic oils, both of them are licensed by Dexos 1, both fully comply with safety standards and regulations set by the government and also both of them are considered perfect for gasoline engines. The major difference between both the brands is that Mobil 1 costs almost double compared to Supertech which is why people usually consider former as superior. Does Brand Matter When Buying Motor Oil? A lot of people have a misconception that more famous brands have better quality motor oil and they usually pay a lot just for the brand name. This may not be true and a recent analysis performed by Blackstone Laboratories indicate that all motor oils are interchangeable. This means that as long as you choose the oil which meets the weight and technical requirements from your vehicle, it does not matter which brand you choose. Choosing a discounted or low price oil such as Supertech will not harm your engine. When Should I change my Vehicle’s Oil? While it does not matter what brand you choose for your motor oil, it does matter a lot that you change the car’s oil at regular intervals. The questions a lot of drivers ask is when they should change the vehicle’s oil and they are given some generic answers such as every 3000, 5000 or 7500 miles but this is not entirely true. The oil change schedule varies from car to car and the best way to find out is to check the car’s owner’s manual. To check the color of the oil, remove the dipstick and check how the oil looks like. If the color is light brown and transparent, it means that the oil is still fresh and does not need replacement. However, once the oil loses its transparency and becomes blackish, it means it should be replaced. To check for consistency, take a bit of the oil from the dipstick and rub it between your thumb and forefinger. If you feel any roughness it means that there is contamination and the oil should be replaced. Every car driver knows how his/her engine usually sounds and it will be easy to judge if the engine is not making ordinary noise. If you notice that the engine noise is louder than usual, you need to check the condition of the oil and possibly replace it. In many modern cars, you don’t need to figure out if you have clocked enough miles for an oil change as they are equipped with an indicating light that tells if the oil should be replaced. 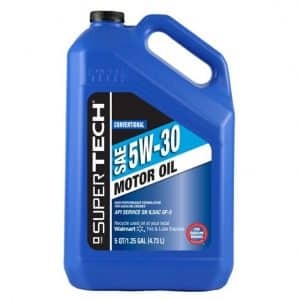 The Supertech Motor Oil can be easily bought from Wal-Mart at an average cost of $20 (pricing for the Supertech full synthetic SAW 5W-30 motor oil). The pricing varies according to the grade and the amount you are buying. You can also compare the pricing from eBay and decide better. Supertech is one of the most popular motor oil available in the market which is both excellent in terms of quality and has an affordable price tag as well. Make sure you fully understand which oil grade is ideal for your car and then choose the right product accordingly.